OMG Posters! 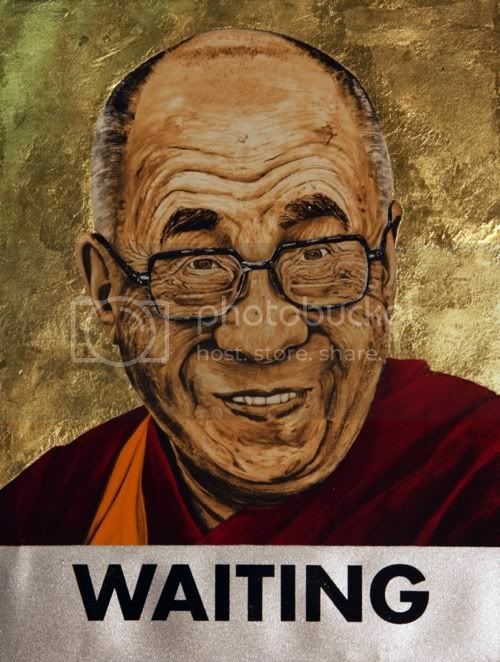 » Archive "Waiting (Dalai Lama)" Art Print by Robbie Conal (Onsale Info) - OMG Posters! 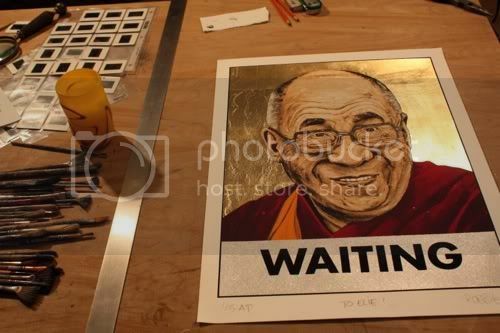 Baurmann Gallery is ready to release Robbie Conal’s stunning new Dalai Lama art print. “Waiting” is a 17″ x 23.5″ screenprint, features genuine, hand-applied 24k gold leafing, has a unique edition of 50, and will be $500. If you’ve ever picked up any of Baurmann’s previous work they did with Mear One, you know this is going to be top quality. These will be available on Tuesday, July 7th at 1pm PST. To purchase, simply wait till the time is right and send the gallery an email. to counter that, derek baurmann has got to be one of the nicest guys putting stuff out right now. not only is the stuff he releases ridiculously high quality (at least the mear 1 stuff i’ve purchased), but he is nothing short of great towards his customers. I bought a Mear 1 from him and had the most amazing experience. He is so diligent it’s crazy. He tries super hard to please. Buying from his gallery has been the single nicest print purchase from service to packaging I have ever experienced. If the Artists do the Art and the gallery does the customer service everyone’s a winner winner chicken dinner. Why would anyone buy anything made by Robbie Conal? Do y’all know what the Dalai Lama looks like??!! He DOESN’T look like this, that’s for sure! This is a print of some deranged old man with a skin disease whose lower lip is bleeding into his wobbly chin!! WTF, I say. Hey, Robbie Conal, what a guy. It always makes me smile this poster…I love it. man, there alot of hate for robbie. 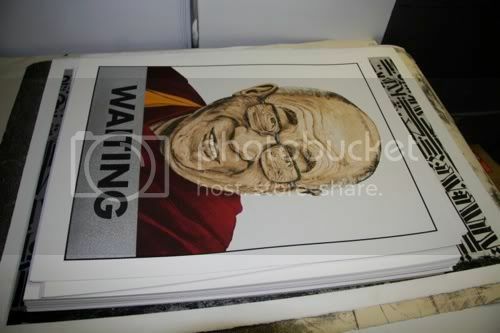 the guy does a print of lennon and the dalai lama and gets persecuted for it. talk about irony. i was just whoaing the gold leaf. i think the artist should do his own gold leaf. awesome gold leaf. robbie rules.! I don’t think using two of the world’s greatest peace activists for profit makes him a good guy. On the other hand: the Dalai Lama can always use more voices, just hope some of the money goes to actually helping Tibet. I would like it if more artists did pieces for him. were they trying to make him look funny? can’t say that I am a fan of this poster.